We are Marina and Berta, two catalan girls that went to Nairobi last July and August and got to meet the beautiful family of Good Samaritan Children’s home and Rehabilitation centre. 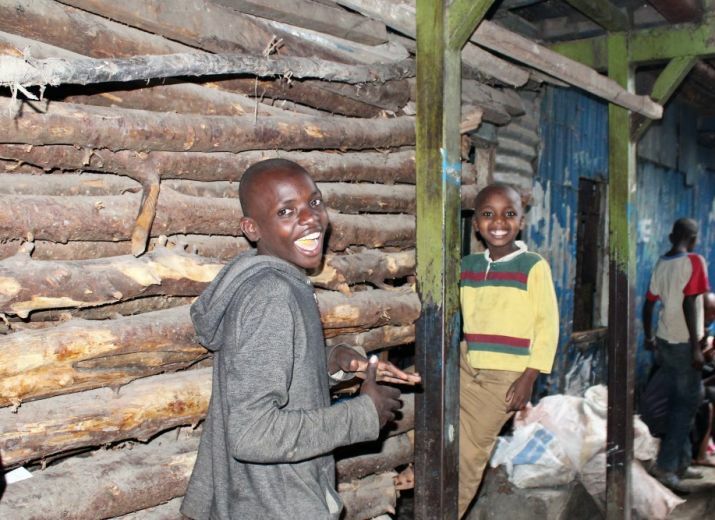 It’s located in Mathare, the second biggest slum in Nairobi. This slum has over 500.000 people living in poor conditions where drugs and alcohol have a leading role. Views of Mathare from orphanage's rooftop. After spending a whole month by their side and getting to know them, we found out that they had a lot of unsolved problems. One of them, among so many others, was the need of a cowshed in order to keep all their cows and chickens safe. Thanks to the cows and the chickens, the centre is able to create some incomings. The orphanage take care of 30 cows and 50 chickens to sell milk and eggs daily, or even to sell the animal if they need urgent money. They also help to feed all the kids in the orphanage. The kids hanging around the cows. The chickens on the rooftop, sharing space with the laundry. Nowadays, mama Mercy hosts over 450 children (even if everyday they welcome a new one in the family). Many of them have been abused, abandoned or they are victims of serious diseases such as HIV or SIDA. That's why it's not only an orphanage but a rehabilitation center. The orphanage was founded in 1991 by Mercy Thuo, better known as Mama Mercy. The main goal was to support all the vulnerable kids and orphans in the area and give them a place to stay that they woul be calling "home". Food, sanity and education is what, still nowadays, the orphanage supplies. This woman down here has been given all she has for anything in return but to give an opportunity to those who though they would never have one. She is mother of three kids of her own and over 450 from other bellies. Education is one of the main conditions for Mama Mercy to let a kid live with them. She wants all of them to go to school and not to quit. That's the reason why the orphanage finances all studies, helped by all their sponsors. She is lucky to remain with few orphans having fininshed their studies, now grown-ups, helping her to make everything possible. All the incomings are obtained from ONGs, personal donations and selling milk and eggs, provided by their cows and chickens. Some of the students, in front of the orphanage, ready to go to school. This cowshed will be 45 meters lenght, 22 meters width and 11 meters height as it will have two floors: the upper one for the chickens and the other one for the cows. Somos Marina y Berta, dos chicas catalanas, que el pasado verano fuimos a Nairobi y tuvimos la suerte de conocer al orfanato Good Samaritan Children’s home and rehabilitation centre, una gran família muy bonita. Está localizado en Mathare, el segundo barrio bajo más grande en Nairobi. Este barrio bajo tiene más de 500.000 personas que viven en condiciones deplorables y en el que las drogas y el alcohol tienen un papel principal. Vistas desde el tejado del orfanato. Después de pasar un mes entero con ellos, nos dimos cuenta de cuantos problemas sin resolver tenían. Uno de ellos, entre muchos otros, era la necesidad de un establo para mantener a salvo sus vacas y gallinas. Gracias a estos animales, el centro crea ciertos ingresos. El orfanato tiene, hoy en dia, 30 vacas y 50 gallinas para vender leche y huevos e incluso, si les hace falta dinero urgentemente, los animales. También les ayuda a alimentar a los niños y niñas del orfanato diariamente. Las vacas en la parcela en frente del orfanato. Las gallinas comparten espacio con la colada, en el tejado. Desafortunadamente, aunque tengan a un vigilante, muchos de estos animales son robados de noche debido a la zona conflictiva donde se situan. Una razón muy importante para echarles una mano en la construcción de este establo. A día de hoy, Mama Mercy acoge a más de 450 niños y niñas (cada día dan la bienvenida a nuevos miembros). Muchos de ellos han sido abusados, abandonados o son victimas de enfermedades como lo son el HIV o el SIDA. Es por eso que es no solo un orfanato pero un centro de rehabilitación también. Algnos de los niños del orfanato. Pero, ¿quién es Mama Mercy? El centro fue fundado en el 1991 por Mercy Thuo, más conocida como Mama Mercy, con el fin de acoger a todos los niños vulnerables y huérfanos de la zona y darles un hogar que pudieran llamar "casa" donde satisfacer sus necesidades básicas como lo son la comida, sanidad y la educación. Ésta mujer de aquí lo ha estado dando todo a cambio de nada, solo para dar la oportunidad a aquellos que creían que nunca la tendrían. Es madre de tres hijos suyos y más de 450 niños y niñas de otros vientres. La educación es una de las condiciones que Mama Mercy exige para aceptar que un niño forme parte de la familia. Ella quiere que todos vayan a la escuela para asegurarles un nivel de vida futura. Esta es la razón por la cual el orfanato financia sus estudios, mediante la ayuda de ONGs, donaciones personales ("sponsors") y las ventas que realizan de leche y huevos. Mama Mercy tiene suerte de disponer de la ayuda de huerfanos que ya han acabao sus estudios, ahora adultos, para hacer todo esto posible. Algunos de los estudiantes, en frente del orfanato, listos para ir a la escuela. Este recinto tendrá 45 metros de largo, 22 metros de ancho y 11 metros de alto ya que dispondrá de dos pisos, el de arriba para las gallinas y el de abajo para las vacas. Suerte con la iniciativa !!! Si necesitáis diseño para el establo, me ofrezco voluntaria ... Besos. Que tingueu molta sort amb la recaudacio i ASANTE PER TOT EL QUE FEU!